At first glance there is lots to like about Gov. 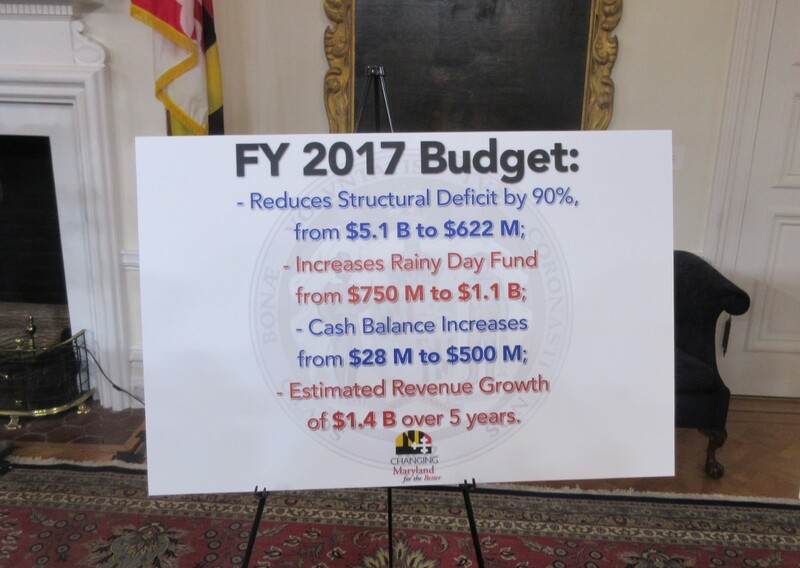 Larry Hogan, Jr.’s new budget. It’s largely a status quo blueprint that keeping spending under expected revenue growth without harming ongoing programs. There’s a bit of sunshine for just about every group – liberals, conservatives, environmentalists, law-and-order types, urban dwellers, rural residents and suburbanites. Yet there’s a yin and a yang to Hogan’s financial plan for Maryland. The Republican governor seems to be pushing the state in different directions simultaneously. While he is keeping a lid on state spending, as would any conservative politician, Hogan also wants to cut taxes – a move that would reignite Maryland’s structural deficit Hogan has pledged to eliminate. First, let’s deal with some of the good news. ?Due to a positive economic outlook, the governor doesn’t have to engage in fiscal tricks to balance his budget. He doesn’t have to ask the legislature to suspend spending mandates for a year so he can shift funds to balance the state’s operating budget. ?He also has a large surplus that allows him to clean up past fiscal finagling by former Gov. Martin O’Malley during the Great Recession, pay off unpaid bills and put the state’s books in order. ?Hogan is pulling back ever so slightly on building up state debt. It isn’t much of a reduction but it could save the state considerably over the next eight years. ?There’s a substantial boost in spending to clean up the Chesapeake Bay, restore funding to retain open spaces and support environmental programs. ?He’s adding extra funds, $150 million, to the state’s annual pension contribution to help underfunded state retirement programs. It’s a small step in a system that is $19 billion short of full funding, but a symbolic one. ?He’s growing the state’s contribution to community colleges by 6% – one of the wisest investments he could make. ?He’s putting new emphasis on spending for prison improvements, rehabilitation and treatment programs as part of his effort to keep minor offenders out of jail and cut recidivism. Included in this category is $35 million to demolish and design a new Baltimore City Detention Center. He’s also boosting local police aid nearly 10 percent. ?The Republican governor is leaving Maryland’s Obamacare program alone at a time when the program is signing up a record number of low-income individuals for health care coverage. That’s a common-sense, nonpartisan move that will save money for the state and for hospitals in the long run. Now for some of the bad news. ?Hogan’s budget already is out of date, thanks to the continuing swoon on Wall Street and a lack of robust consumer spending. This is likely to throw revenue estimates off by hundreds of millions of dollars. ?Hogan’s large budget surplus announced last week could largely evaporate by the time new revenue forecasts are put out in March. ?This, in turn, makes it unlikely Hogan will get the tax cuts he’s seeking this legislative session. ?With Maryland’s weak economic rebound now facing a costly dig-out from the Blizzard of 2016 and possibly more bad weather to come, this isn’t the best time to press for action that shrinks state revenue. ?Hogan’s capital budget puts too much emphasis on highway construction and not enough on the Port of Baltimore and mass transit. More alarming is his long-range plan to cut nearly $1 billion from transportation spending in 2021 – an unrealistic and dangerous move. ?Hogan is claiming credit, as does every governor, for funding education at record levels. In fact, he’s mandated by law to do so. He’s even taking credit for fully funding a program that helps high-cost counties run their schools – a program he cut in half last year. Angry lawmakers then required Hogan to put the full $137 million in his budget this year. ?Hogan added $5.6 million to his budget to help three Republican counties cope with falling school enrollments. Yet he refused to help Baltimore City’s school system, which faces a loss of $21 million partly due to its own declining enrollment. This funding inequity won’t be permitted by Democratic lawmakers. ?Hogan fails to give battered and struggling Baltimore City much relief. It’s the only large subdivision that doesn’t get a big boost in state aid — $3.1 million for the city versus $24.7 million for Baltimore County, $26.7 million for Anne Arundel County, $44.3 million for Montgomery County and $83.4 million for Prince George’s County. On a percentage basis Baltimore City gets less of an aid increase – 0.3 percent – than any other Maryland subdivision. ?Hogan’s budget documents focus on the state’s continuing gap between ongoing spending and tax revenues. Yet the governor wants to diminish state revenue through tax cuts, which will worsen the situation. Hogan complains about this key fiscal gap but doesn’t fully address it in his budget proposal. We’ll learn much more about the governor’s blueprint when the legislature’s fiscal advisers start their round of budget briefings after the snow dig-out. Their analysis will pinpoint further weaknesses and oversights in Hogan’s plan as well as its strengths. Given the uncertain economic outlook, a go-slow approach might be the best possible outcome.